I have all the best intentions, I swear I really do. I want to utilize this more as I do have content that I could blog about. It’s more that I’m an unorganized fool and creating a coherent post requires some a degree of substance that I often lack when it comes to instructionals and how to’s. There’s things I’ve tackled that in hindsight would have been good to document, but in reality it’s been heavy on the networking end and light on the server end of things. If I can find a way to wiggle in some NSX I plan on doing that as well. Maybe some stuff with 3CX, I started some stuff but never finished. I will be moving soon to a new home, and it needs cabling badly, so there’s that. Containers, because it’s all the rage. And lastly, you’re doing it wrong posts! I see things being done wrong all the time, especially cabling. Maybe I’m a quirk but I get a kick out of it. That’s really about it for my short-term road map. I was hoping to get a higher powered server for the house here but with the new place and new expenses like a mortgage, this is un-likely. As a result, the 2012r2 vm’s have gone dark and dhcp/dns essentials are now running on linux boxes. I did this in preparation of the ESXI host being nested in here. Not much has changed in terms of hardware except the addition of a ZFS pool hosted on a workstation/server. The bad news is that where I am moving, I will be loosing the static IP and the fiber. I’ll be stuck with comcast and I still haven’t figured out what I’m going to do about that. So maybe stay tuned, I will do my best to stay true to my words. I need to do this so I can work on my documentation/instructional/organizational skills. I mean I really need to do this. 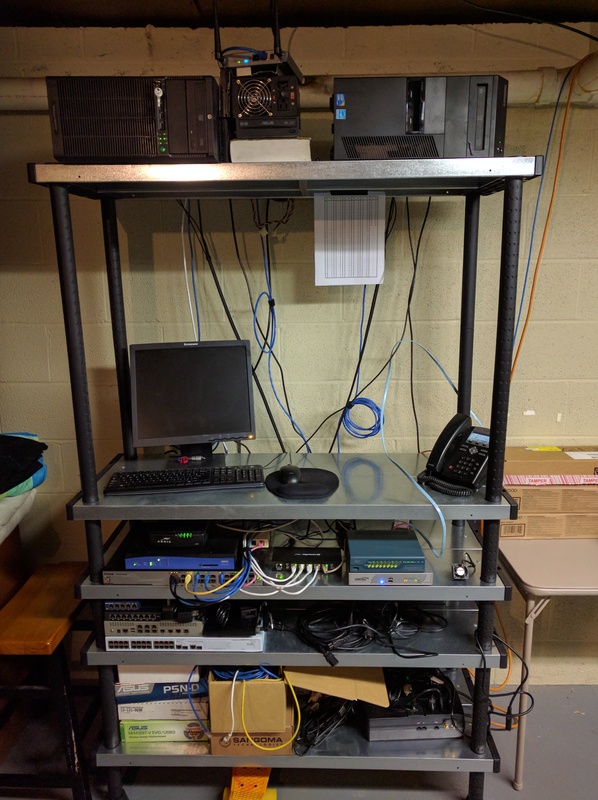 So I give you something, here’s the current lab down in the basement. Previous Post Webmin, where have you been?